Little Red Riding Hood searches for her missing Abuelita all over the forest, encountering many fairy-tale characters and finally happening upon a surprise. Little Red finds a note on her grandmother’s door telling her to “Go next door!” That’s the Three Bears’ house, but they tell her Abuelita’s not there and give her a plate of empanadas. At the Three Little Pigs’ compound, the busy porkers send her on with tamales. Everyone in the forest encourages her to keep looking and adds food to her basket. Deep in the forest, Little Red finally reaches her own surprise birthday party, given by her Abuelita and forest neighbors. The primary narrative appears in the margin, with the rest of the double-page spread occupied by a colorful scene that incorporates flaps labeled with the English names of various elements (“door”; “bear”). Lifting the flaps allows readers to see the Spanish translations and pronunciations (“la puerta / la PWEAR-tah”; “el oso / el OH’-so”). Despite good intentions, this mildly pleasing book is flawed with errors and omissions. 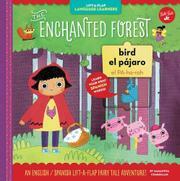 Gender-dependent vocabulary defaults to masculine; a mother duck is rendered “el pato,” for instance, and a pig in a dress is labeled “el cerdo.” Hansel and Gretel greet Little Red with a glaringly incorrect “Buenas días.” The foodstuffs, however, are presented without explanation or translation, and readers who know some Spanish will wonder why Little Red’s name is in English.